A Mid-Western native (WI, MN), Marga Richter (b. 1926) earned her Bachelor's and Master's degrees in composition at The Juilliard School where she studied piano with Rosalyn Tureck and majored in composition with William Bergsma and Vincent Persichetti. 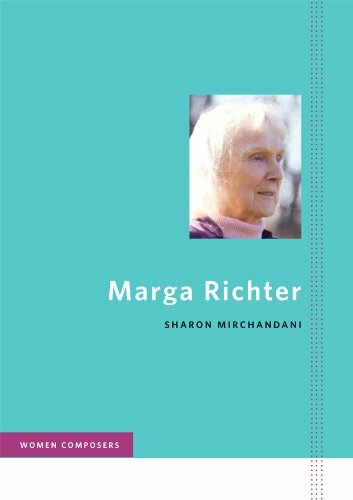 She has written over 150 works, encompassing virtually every genre. Her orchestral music has been played by over 50 orchestras including concert performances by the Atlanta and Milwaukee Symphonies, the Minnesota Orchestra, the Buffalo Philharmonic, the Civic Orchestra of Chicago, the National Gallery Orchestra, Eastern Philharmonic Orchestra and the Oakland, Oklahoma, Tucson, Oakland, Madison, and Maracaibo Symphonies, and recorded by the London Philharmonic Orchestra, the Seattle Symphony, the Bournemouth Sinfonietta, the Czech Radio Symphony Orchestra and the Polish Radio National Symphony Orchestra. One of her best known works, the ballet Abyss, was performed on five continents by the Harkness Ballet, which commissioned it in 1964, and subsequently by the Joffrey, Boston, Pennsylvania and Connecticut ballet companies, and in concert, sans ballet. Quantum Quirks of a Quick Quaint Quark begins at 0:34. From the album Poetic Images Beyond Poetry, Ravello Records. Recorded in 1995 in Prague. Out of Shadows and Solitude begins at 9:12. From the album Poetic Images Beyond Poetry, Ravello Records. Recorded in 1996 in Seattle. Fandango Fantasy begins at 13:33. Where is she? from the chamber opera Riders to the Sea begins at 18:15. The stick Michael brought from Connemara, from the chamber opera Riders to the Sea begins at 20:14. Ah, Nora, isn't it a bitter thing to think of him floating that way, from the chamber opera Riders to the Sea, begins at 22:46.